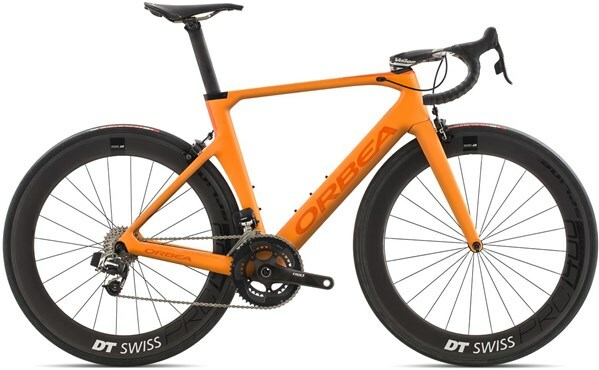 A racing spirit lies at the heart of the Orbea Orca Aero M11i Team aero race bike. A lightweight OMR carbon frame forms the basis to a super fast bike that’ll allow you to cut through the air. SRAM’s Red eTAP wireless electronic drivetrain does away with all cables and wires, allowing you simplified and high performance shifting to get you racing at the head of the pack. DT Swiss PRC 1400 Spline 65 wheels are deep dish and lightweight carbon, giving you that extra wind-cheating advantage. Freeflow - Rotation of the spokes and today's wider rims and tires approaching from behind the fork (against the flow of wind as the wheel spins) creates a high pressure/high drag zone. Freeflow spreads the fork legs away from the area to reduce pressure and turbulence. Normal directional aerodynamics remain unchanged, but the bike gets faster because the airspace inside the freeflow fork blades is less chaotic.